THE WOLF’S HOWL [OS-2] – Attenzionen!!! According to Germans tactical doctrine a position taken by enemy forces should be attacked immediately. The rational is that the enemy will otherwise have time to dig in making it costly to dislodge him later. 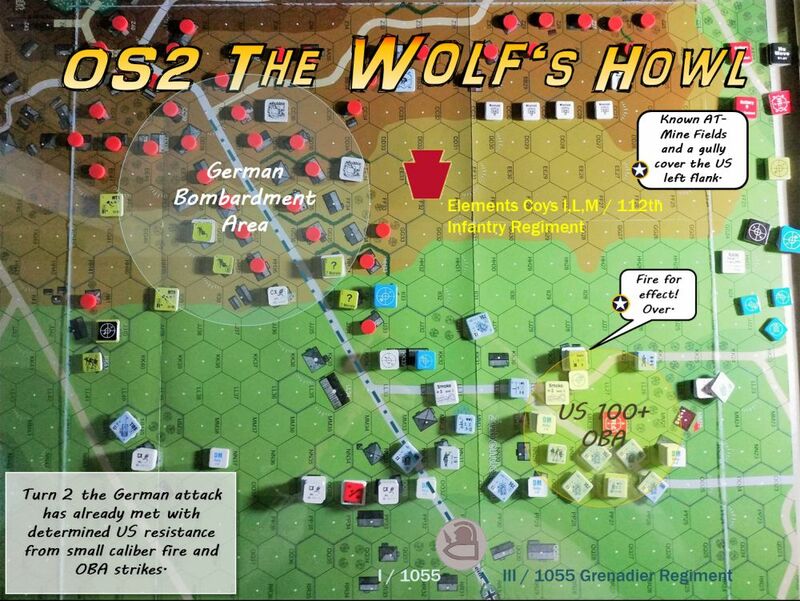 Thus when the US 28th Infantry Division occupied SCHMIDT the Germans immediately staged a counter attack by the GE 89th Infanterie-Division to retake the village. Victory Conditions call for the Germans to control ≥ 36 Stone Buildings on/west of Hexrow KK at Game End. The game starts with a Weather DR of ≥10 and thus it starts raining (+1 LV Hindrance >6 hexes) and a German bombardment that rubbles a few houses but otherwise has little effect. The Germans move to attack the town from north-east with III/1055 GrenRgt right, I/1055 GrenRgt left. the Germans encounter heavy resistance from the start. In fact, the US 9-2 Ldr accompanied by a HS and his Radio is cought on a recon of the forward positions when the German attack strikes. This puts him far forwards of his command. It also puts him in a prime position to call in an artillery strike from the 100+mm OBA dedicated to the 112th InfReg. 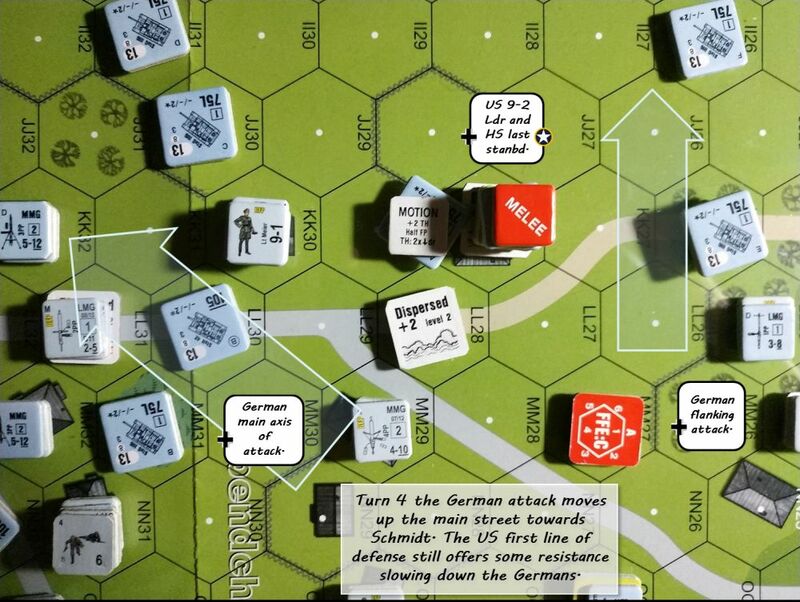 The German’s aggressive attack is slowed down by determined American resistance. 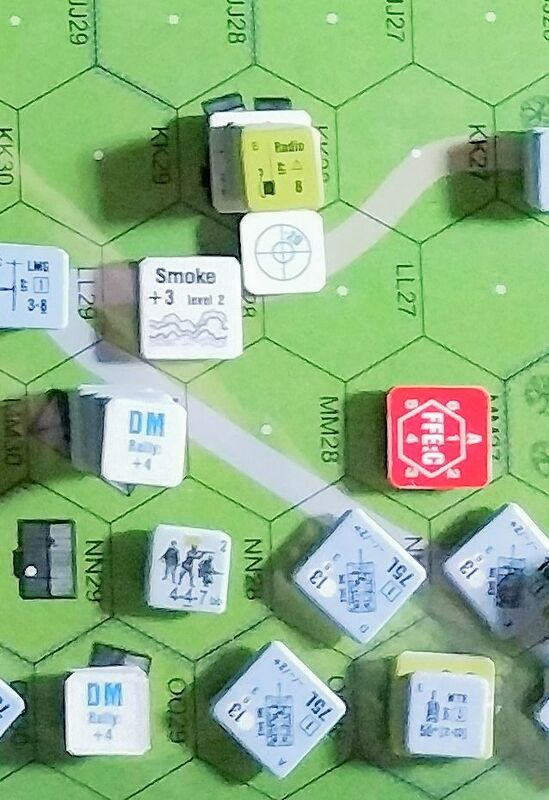 Small pockets of US doghboys and the powerful US artillery strikes take their toll and stall the German advance long enough to secure an American tactical victory with only 28 Stone Buildings taken. The Germans lose a JgPz V destroyed, a StuG IIIG recalled, 3 Leaders (8-1, 2x 7-0), 8.5 Squads killed. This is about 20% of their AFV, 50% of their Squads, and 50% of their officers. The US lose 3 81mm Mortars capured, 1.5 Squads POW, 6.5 Squads, a crew, and 3 Leaders (9-2, 8-0, 7-0) killed. This comprises of 100% of their ordnance, 50% of their MMC, and 50% of their officers. This serves as testimony to the vicious fighting the units where engaged in. The scenario plays very enjoyable. Playing it solo SASL like added to the fog of war and created situations that were quite unique. A virtual storyline emerged during play. 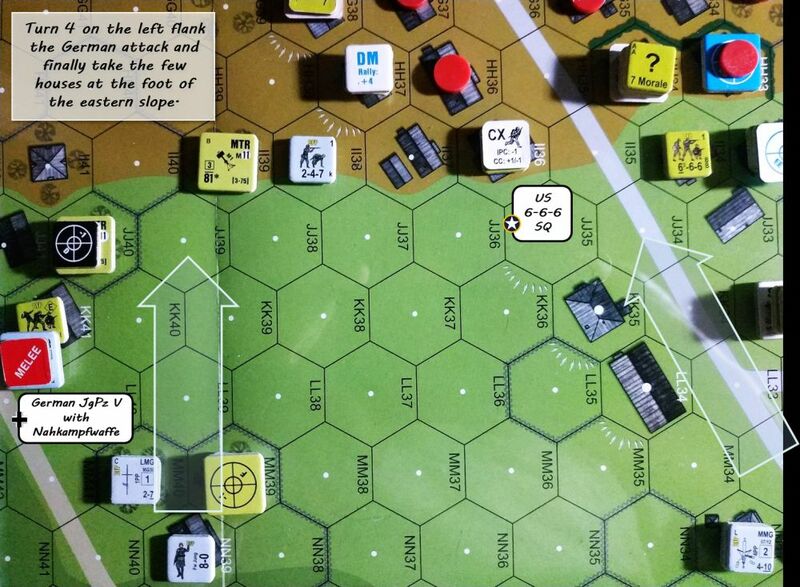 + Very interesting situation, terrain, and and mix of units. – OBA has a tremendos impact on the balance.